I include this article in the science section of my site, not because it is scientific proof of anything, but because it appears to warrant scientific investigation. I find myself in an unique position. I have become a water detective. For some years I have attempted to assist the welfare of a young woman whose health has spiraled into the most critical condition. Her history is one of witnessing and experiencing extreme violence and cruelty. She lives two hours away by car and my input has historically been to assist her by phone from time to time, while supporting her in attempting to get appropriate care. My appraisal of her situation is that her history has broken her inherent strength and vitality as one would expect from constant abuse. 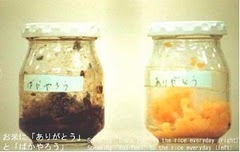 According to Masaru Emoto’s ‘Rice Experiment’, this abuse may have had an intrinsic effect on the architecture of her body fluids, which in turn would no longer support her physiology. The initial emotional and physical abuse has I am sure led to retention of toxins including heavy metals, herbicides and pesticides and a substantial microbial load. And indeed this has been confirmed through bio-resonance testing. The ultimate breakdown or her health has been so severe that ‘Jane’ (pseudonym) finds herself bedridden, severely malnourished and inappropriately and inadequately supported by social services. ‘Jane’s’ sensitivity has become so pronounced, that she struggles to eat any food at all. Scrupulous preparation of mashed foods is necessary, and the slightest ‘wrong move’ is picked up, rendering Jane incapable of eating. Her entire autonomic nervous system is on a hair trigger and massively over-reactive. She is always in pain, but if an attempt to eat the ‘wrong food’ is made, intestinal and urinary tract pains become unbearable and the food is regurgitated. It is easy to misunderstand Jane’s hypersensitivity as ‘psychological’ and therefore not real. Only those who have worked closely with bio-resonance testing will truly be aware how sensitive a human being really is, and with that knowledge I understand that Jane is simply existing on a knife edge, where tolerable stress is almost zero. Noises, smells, electricity, and even emotional tensions are all too much and cause immediate physiological reactions, and in that sense, her system behaves very much like that of a severely autistic child – but more extreme than any I have ever seen. For the past 2 years we have struggled together to find water Jane can drink. It is a serious issue. We have to be very straight with one another. All bottled waters became impossible for her to drink and I fortunately had an answer in the form of Plato H2O. This at the time was the only ‘structured water’ I knew of that has been observed by Fenestra Laboratories to increase cellular hydration in the average population by 23% in 30 days. No other water they tested increased the hydration inside the cells (cellular hydration). For a time this was an adequate solution, however increasing amounts were needed to restructure the water she was drinking, until ultimately only neat Plato H2O was sufficient. This became prohibitively expensive and other solutions were being sought. It was also apparent that the Plato H2O was somehow degrading when in Jane’s possession for more than a few days. Again informed by Emoto’s water crystal experiments we tried blessing the water, prayer, love and gratitude given to the water in meditation as well as written on the bottles. We tried images of Jesus as Jane has a strong Christian faith, and multiple combinations of these things. The next breakthrough came when we introduced MEMON transformed water. Memon is a beautiful technology which eradicates environmental pollution from water at a vibrational or frequency level. It not only restores water to a native, simple, hexagonal architecture (using Darkfield Microscopy) but is believed to neutralise physical toxins in the water as well as electro-smog affecting it from outside. Initially I would expose 7 stage filtered water to a Memon Water Transformer for several hours, then send this water by mail to Jane. Seeing this work, we then invested in a technology for her home so she could do it for herself. This never had quite the same effect and while it worked to some degree for a while, a new solution became necessary. It began to appear that something in Jane’s home environment was voiding the benefit of these water solutions. Another breakthrough came in the form of ‘Pear Tree Well’ water. A beautiful healing water from Uckfield of all places. We began shipping 20 liters of water to Jane at a time. Her body craved it and she began drinking 5, 6 liters, or even more per day! Her pains began to subside a little, and we hoped she might turn a corner. But there was a problem. As her consumption of the water dropped and each tank lasted more than a couple of days, the same pattern set in and she was again unable to drink the water that had been in her home environment for more than about 48 hours. Having seen the Kirlian and Darkfield microscopy of this water I knew it had high vitality and a highly organised architecture. Again somehow these were being broken down over time. I had just discovered Omega Wash, a blend of 14 organic oils which I witnessed doing remarkable things for many. Thinking that this might address pathogens in Jane’s intestine which might be contributing to her pains, I sent this for her. By adding Omega Wash, Jane again became able to drink the Pear Tree Well water. Soon though, she was up to a bottle a day, which even with the generous help of Nigel from Smart Organic Solutions, was becoming prohibitively costly. And true to form, even the Omega Wash was vulnerable to the destructive influence in Jane’s environment. There are two obvious candidates for the destructive force that has made itself so clear in this case. One is Geopathic Stress, and the other is of course Jane herself. I am fully aware of both (and a number of others besides) but do not wish to be distracted from the focus of this article by discussing them here. At this stage, supporting Jane has become most unwieldy. We need to finance both regular deliveries of Pear Tree Well water and Omega Wash, and these have to be delivered on a ‘just in time’ basis, because otherwise they will deteriorate and will not be able to be taken. In recent weeks we have had snow like I have never seen in the South of England before. Jane has been left without Omega Wash or fresh Pear Tree Well water. A new solution became immediately necessary. My fanatical research into all things physics related, threw up a contender. An interview with David Sereda revealed that NASSA has recorded the sound of each of the planets in our solar system as well as the Sun itself. The Sun recording was then sped up 14,000 times so that it can be heard by the human ear, and Sereda had the whit to observe how water responds when exposed to this sound. The way water reorganises itself under the microscope, when exposed to the sound of the sun, is nothing short of astounding! But equally interesting to me was the fact that using recently developed technology by a Russian called Korotkov we can now see the human chakras and that when exposed to the sound of the sun all these become subdued, except the heart chakra which is substantially amplified. Energising the heart chakra is significant for many reasons. In spiritual practices we are educated that the heart is our centre and the seat of the soul. In science we are now able to observe that the heart reacts faster to events than the brain. Certainly the heart is where we find stillness, and in the case of a severely ill and traumatised human being, getting them out of their head and into their heart is healing as demonstrated by the decades of research by Dr Alfed Tomatis, whose listening therapies I have had the privilage to explore. I downloaded an MP3 of the Sun recording and sent it to Jane for her to play to her ‘dead’ water. I also forwarded her this image of water’s response to the sound. With her remarkable sensitivity, Jane could already tell me that the water structure was powerful. In fact she didn’t like it because it set up a vibration in her body, which made the existing pain in her hands more intense. I encouraged her to play the music, which she did, and reported a mildly positive physiological response, but I knew she just had one very poor computer speaker, and there was no improvement in the water. Jane could not drink and time was ticking. Going back over the data I discovered that this recording spanned our entire audible range from 20hz to 20,000hz. One tinny, broken speaker would not do. Aware of research demonstrating quantum effects in water over great distances I acted on a hunch. The research shows that a body of water, if split in two, continues to respond as one. In other words if you put a great distance between the two halves and only ‘shock’ one, both respond in the same way and simultaneously. I confirmed with Jane by phone that she could not drink her water, then took a 10 liter tank of Pear Tree Well (the same body of water as Jane had) from my own stock and exposed it to the sound of the sun though my inexpensive television surround sound system with sub-woofer. It took one minute and four seconds. During this time I was thinking of Jane and moving the water from the woofer (low frequencies) to the tweeters (high frequencies). I immediately called her back. She tried the water and came back in high pitched disbelief. “Oh my God. It worked. I can drink it…”. Later I received a call to say that although the remote ‘reprogramming’ of the water in the bottles by her bed, there had been two further 10 liter tanks elsewhere in her house and these had failed to transform. Confident in this new process, I simply asked that the other tanks be brought into the room, and I repeated the process – But it didn’t work. Playing the sound to my water again, there was a split result. The tank which had been shipped direct from the supplier hand not transformed so remained undrinkable. Whereas the other tank which had come from my own stock converted even though it was now 30 miles away. Could it be that the sound combined with my consciousness could only transform water that I have had contact with? I didn’t know, but I believed we were set for the next 3 days or so. A call later the same day revealed that the reprogramming wasn’t holding for more than an hour or two, and I tried several times in vain to revitalise the remaining tanks. I began to question what I was doing differently. Was I to focus on Jane or the water or the room? Or should I simply let the sun sound play without my involvement? Finally I discovered the first set of water had been close to Jane while subsequently the tanks had been across the room. I asked for the tanks to be put close to Jane and went through the process again. This time we had success. The water tanks around her bed became drinkable and I had a new piece of my puzzle. Proximity to the recipient seems important. Next day I recharged the water twice more with success. Then we hit another dead end. Several attempts to restore the water failed. Jane listened to her track while I plaid mine, I focused on the water in her tank, then on mine. Then I focused on her. Nothing seemed to have the desired effect. I sat and meditated, just trying to hold focus on my own heart chakra. Then a glass funnel popped into my head, with a bead of water falling from it. I concluded the water needed movement, and that once too static in that environment it couldn’t respond. I asked for the water to be shaken and plaid the track again. This time Jane reported with even greater excitement that she could drink the water again. At the time of writing I have ordered some speakers with a response range of 40hz to 20,000hz to be delivered to Jane, but since there is nobody to shake her water, I have been unable to transform any water this evening. I am fascinated to see if shaking the water tomorrow morning will make the difference.